Are you using whatsapp Application on your Smart Android devices without the cheap whatsapp subscription plans? Or are you yet to find out how to subscribe to whatsapp plans, should i say you have missed alot if the cases above were experienced by you. lolz. Even as that, it is never to late for you to enjoy with others from same pot of joy. This post will guide you on how to subscribe for cheap whatsapp plans for weekly and monthly. Now, do your self the good by reading on below. 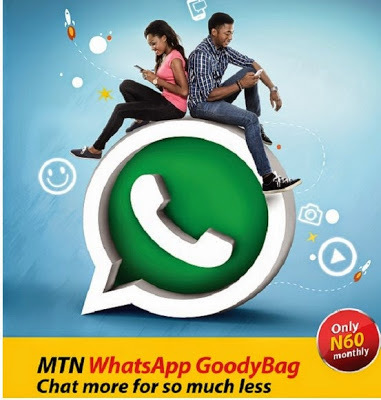 MTN whatsapp Goodybag is a data carved out only for whatsapp application on MTN network which is found in Nigeria. The data go a long way in offering users unlimited connection for this very social media app known as whatsapp, at a very low and cheap price. users of whatsapp on MTN network can subscribe to this plans for weekly and monthly at the price of #25 and #60 respectively. Just get your phone ready and recharge your MTN line, making sure that the airtime on it is up to #25 or above. Then, goto your message box and text WAW to this number 131. That's it. The weekly plan has a validity of 7days. The code for monthly is also easy as the weekly plan, with same format, but only a little change you will have to make for that. Make sure you have up to #60 Airtime on your MTN line, then text WAM to 131. After that, MTN network will reply you with a success message showing that, the subscription was successful. The monthly whatsapp plan has a validity of 30days before expiry. You can choose not to go by subscribing to the whatsapp plan by sending message. You can as well subscribe for any of the plan for (weekly or monthly) by dialing *131# >> reply 7 >>> reply 3 for whatsapp >>>> then select 1 or 2 for weekly or monthly plan. Note: If the weekly or the monthly plan got exhausted before the date of expiry, and you want to subscribe again to continue whatsapping. Then, at this point, you need to "opt-out" and then follow the above steps to subscribe again. If not, you cannot be able to subscribe again until the date of the previous sub you did got expired. How To OPT-OUT From Whatsapp Subscription, In other to Subscribe Again. Dial *131# >> reply 7 >>> reply 3 >>>> and then 3 to Opt- out.